The HydraFacial™ treatment is the newest advance in non-laser skin resurfacing. HydraFacial is the only hydradermabrasion procedure that combines cleansing, exfoliation, extraction, hydration and antioxidant protection simultaneously, resulting in clearer, more beautiful skin with no discomfort or downtime. The non-invasive treatment is soothing, moisturizing, and non-irritating and offers immediate and noticeable results with little to no downtime at all. The HydraFacial treatment improves the appearance of fine lines, wrinkles, congested and enlarged pores, oily or acne-prone skin, hyperpigmentation and brown spots. The HydraFacial treatment is designed to achieve similar results to microdermabrasion and laser exfoliation, but much less harsh on the skin than those treatments. 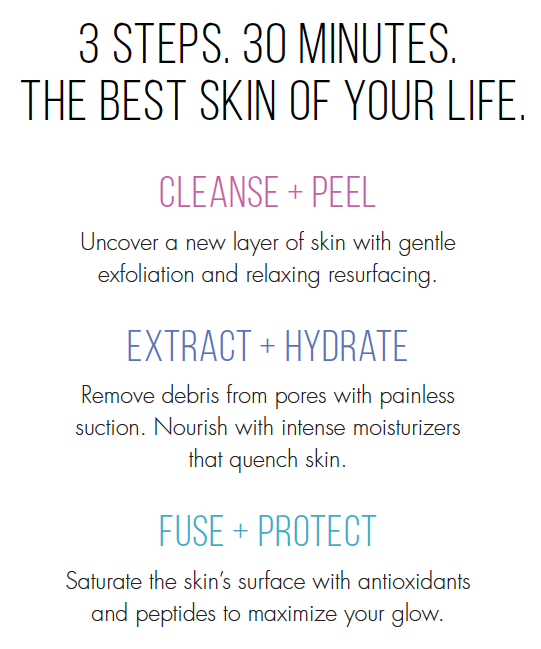 HydraFacial achieves results through gentle, liquid-based exfoliation rather than targeting and destroying skin cells to stimulate the body’s repair processes like other, more aggressive treatments. The HydraFacial procedure is suitable for most skin types, including thin or aging skin, ethnic skin, and dry skin or oily skin. What are you waiting for? Start your skin maintenance program now with HydraFacial and slow down your skin’s aging process and delay the need for invasive procedures. See Pricing. Add CTGFTM to improve the appearance of skin tone, texture, and elasticity.